Passed by the State Legislature in 1986, Senate Bill 1086 called for a management plan for the Sacramento River and its tributaries that would protect, restore, and enhance both fisheries and riparian habitat. The law established an Advisory Council, composed of representatives of state and federal agencies, county supervisors, and representatives of landowner, water contractor, commercial and sport fisheries, and general wildlife and conservation interests. After more than 50 lengthy meetings and workshops, the Council and its action teams developed a plan which included a specific and action-oriented fisheries plan and a more conceptual riparian habitat plan. This plan, the Upper Sacramento River Fisheries and Riparian Habitat Management Plan (1989 Plan), was published in 1989. Many of the fisheries action items have since been, or are currently being, implemented, such as fish bypass structures at diversions on Sacramento River tributaries and the Shasta Dam temperature control structure. The Riparian Habitat Committee of the Advisory Council, an informal and consensus-based planning group that included landowner representatives, environmental group leaders, and agency personnel, continued the work of on-the-ground implementation. The Advisory Council was reconvened by the Secretary of Resources in 1993 to "complete its earlier work concerning riparian habitat protection and management, including the development of a specific implementation program." 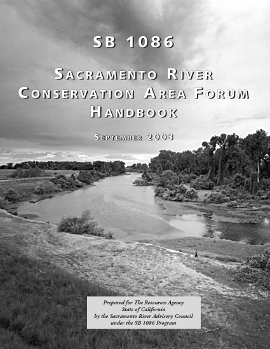 The committee developed this Handbook to guide an implementation program for riparian habitat management along the Sacramento River, and worked to ensure that this Handbook addresses both the dynamics of riparian ecosystems as well as the realities of local agricultural issues. It did this by developing a set of guiding principles and planning tools that should govern riparian habitat management along the river. Below are links to download the handbook in its entirety or in part. Any questions or comments about the on-line version of the handbook can be directed to Robert Irwin. Or the SRCA Handbook can be downloaded in portions below.